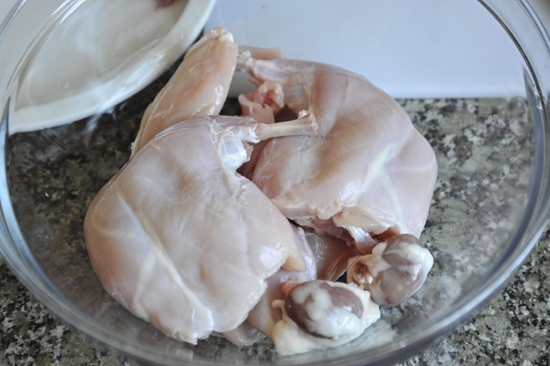 Raise your hand if you have rabbit or chicken in your freezer. I am about to embark on a hunting spree. 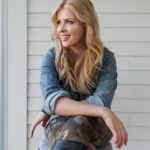 Elk in Wyoming, Javelina in El Paso, Pheasant in South Dakota, Partridge in England, Snowshoe Rabbit in Alaska, Squirrel in… where should I hunt squirrel? I hear they really know how to do it in Kentucky. 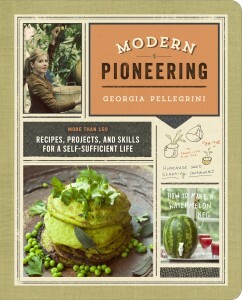 And all the while I’ll be cooking up recipes for my next book. 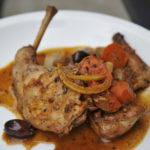 This is a sneak peak at a braised rabbit recipe I have been working on. Did you know that the rabbit family, Lagomorpha, is one of the oldest mammal families known? In Asia and North America, fossilized remains have been found dating back 50 million years. It is represented often in prehistoric art and was a significant food source for prehistoric people in the United States. 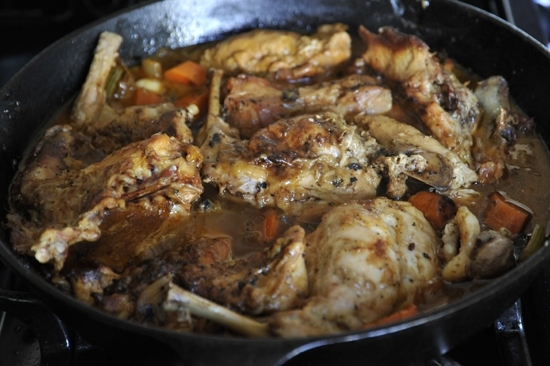 Braising is one of my favorite techniques with rabbit and with game meat in general because the meat just falls off the bone in a luscious kind of way. I don’t think I’ve ever consumed anything braised that wasn’t delicious. 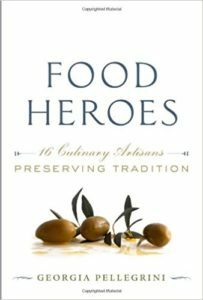 But it lends itself especially well to game meat, which contains less fat and more muscle tissue. 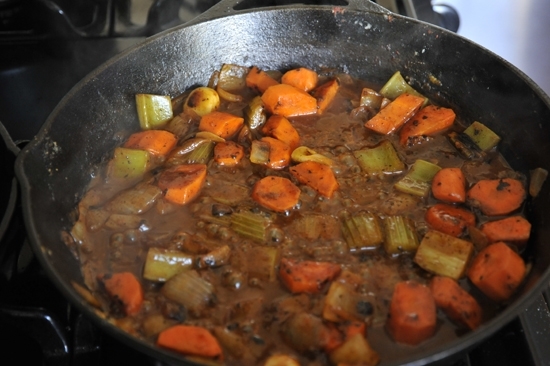 This braised venison recipe for instance, is a good example of braising in all its glory. 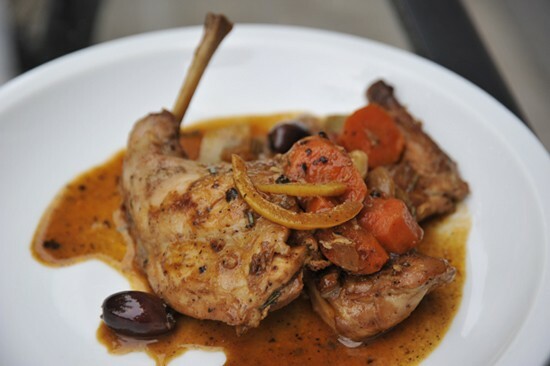 In true French form, this braised rabbit is a multi-step process, but it is worth it. 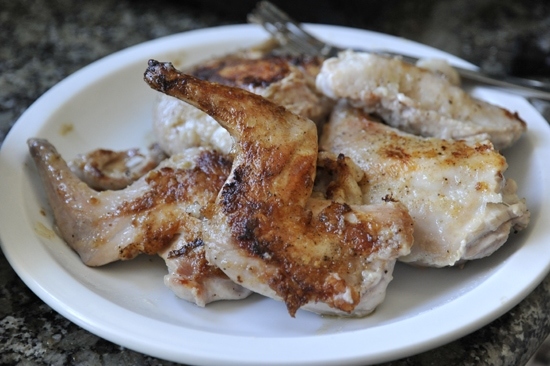 The marinade will help tenderize the meat and that little bit of flour gives the meat a thick browned coating. These are some of the things you will need. It seems like a lot, I know. It’s how the French roll it seems, but the flavors are really worth it. You can always pare it down if you want, it’s the braising that is magic. 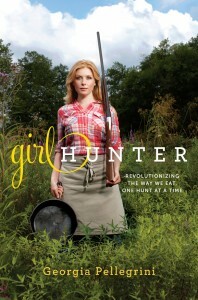 You’ll start by quartering the rabbit and setting the carcass aside for roasting. 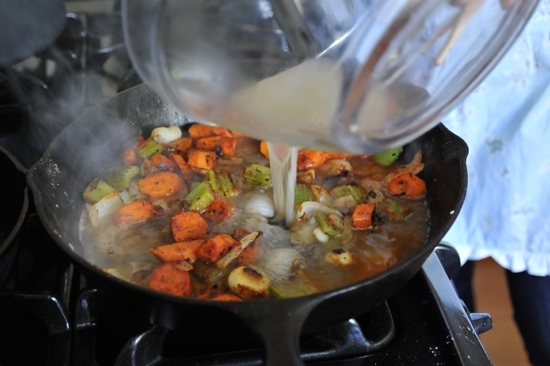 That will reinforce the flavor of your sauce. 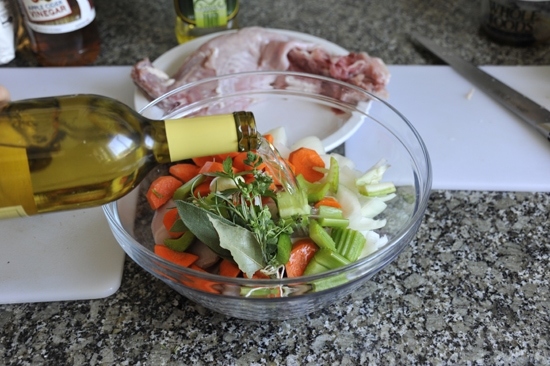 You’ll then add the quartered pieces on the bottom of the bowl, covered by the vegetables, garlic and bouquet garni. Then in goes the wine! I love wine in food. Almost more than I do on its own. I know that is sacrilege. You can disown me now. 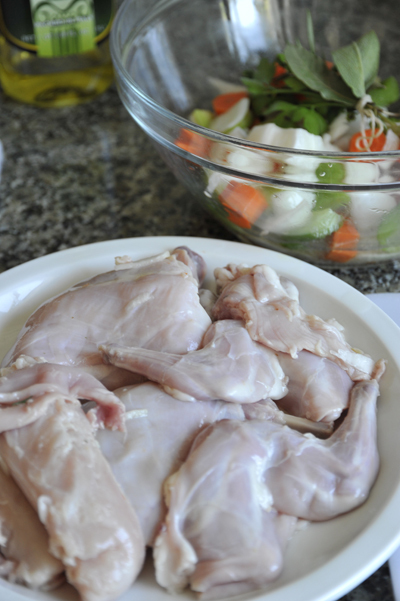 Then remove the meat, set it aside on a plate and pat it dry. Sprinkle with salt, pepper and flour on one side. 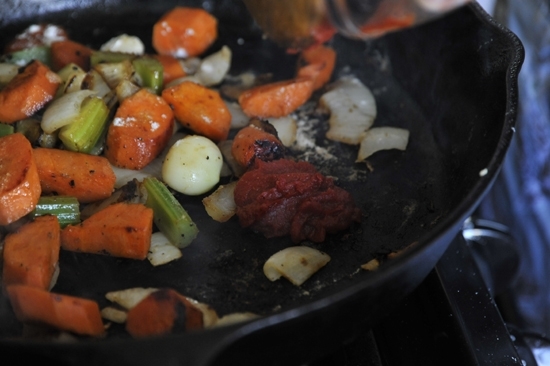 Git yer skillet nice ‘n hot. With buttah. 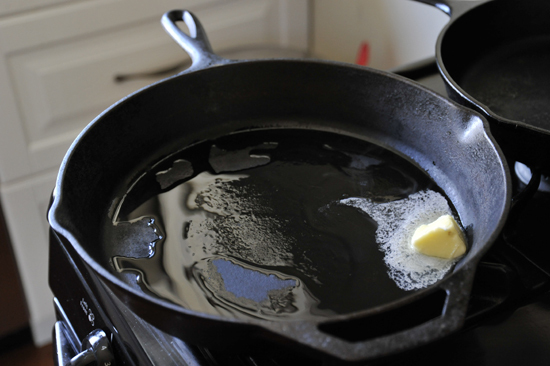 There’s nothing like a hot skillet coated with butter. There isn’t. Lay the pieces down, flour side facing the pan. 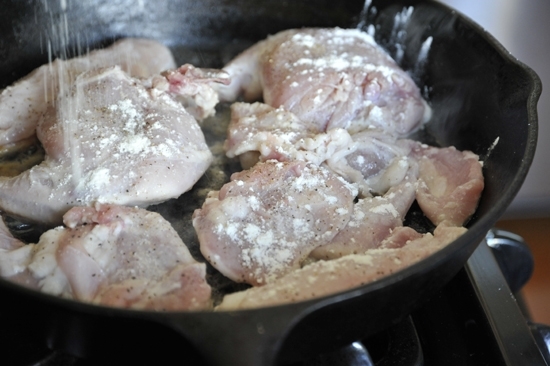 Then add salt and pepper and flour to the naked side. Then flip over once it’s well browned. 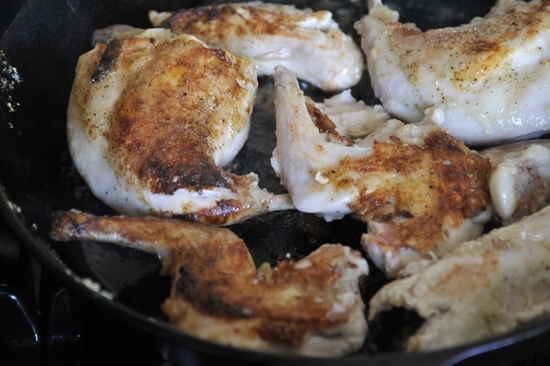 Set it aside on a plate when both sides are browned. 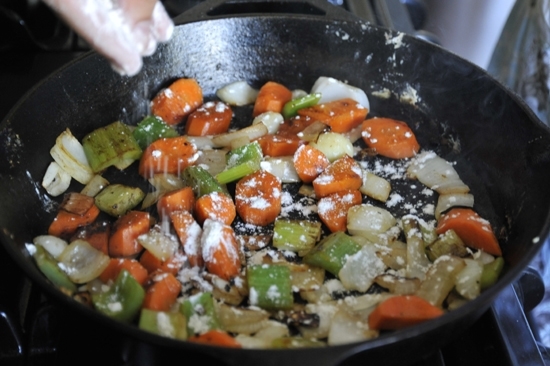 Add more butter to the skillet and add the veggies. Sprinkle them with a bit of flour as well. Then a bit of vinegar to jazz things up. Then the marinade that everything was soaking in earlier. Let it all reduce to a thicker consistency. Things will start to smell pretty intoxicating at this point. 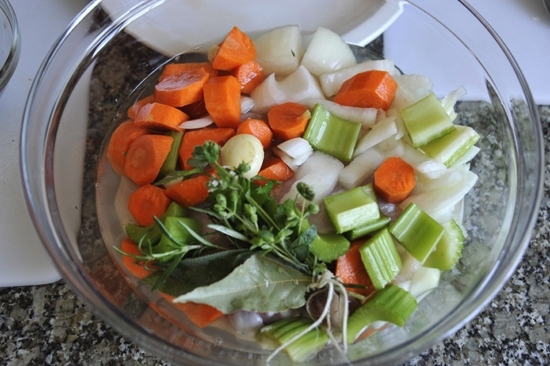 Next comes the chicken stock. I had this in my freezer from one of my Sunday roasted chickens, but you can used the canned stuff too. 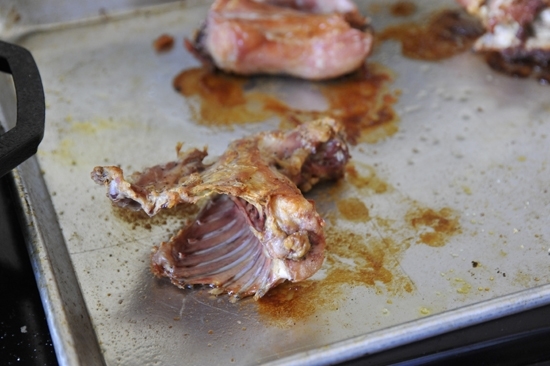 If the bones have been roasting, now is the time to take them out and add them to the mix to reinforce the flavor. Cover her up, lower the temp and walk off for a bit. This is what it will look like once it’s been stewing for a while. When the meat is tender to the bone, add the preserved lemons and parsley. Remember when we preserved Meyer lemons together for a rainy day? Here’s another way to use them. And then you serve it up, simple as can be on a plate. It will taste just as good the second day. And also days after that. It’s the braise that keeps on giving. 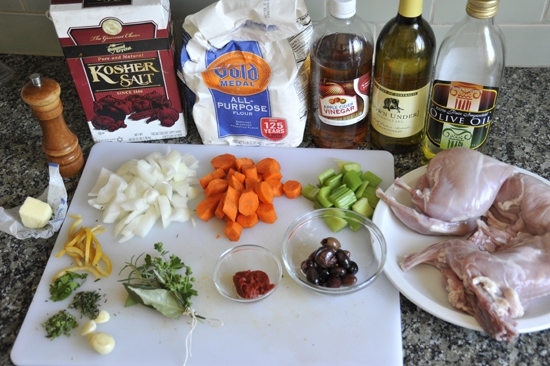 Combine all ingredients except the rack of rabbit in a bowl and let sit at room temperature for at least one hour. 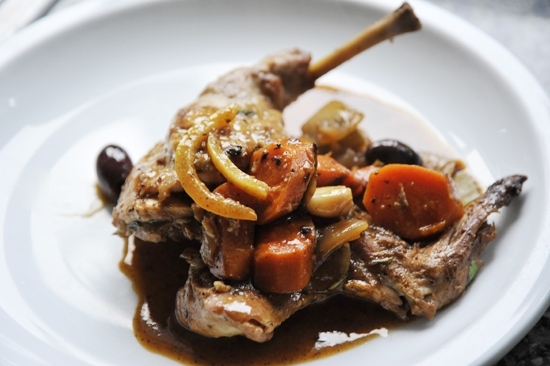 Lightly grease the rabbit rack, place on a sheet tray, and roast for 20 – 25 minutes or until well browned. 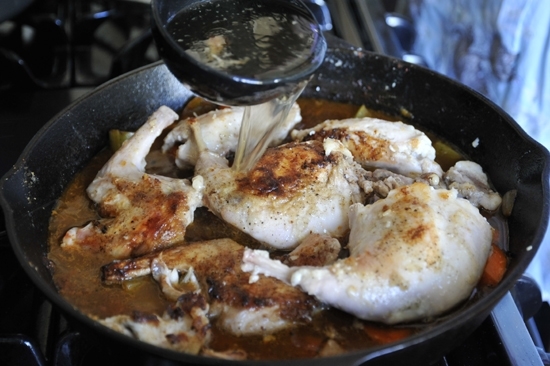 In a heavy-bottomed skillet over medium heat, add the olive oil and butter. 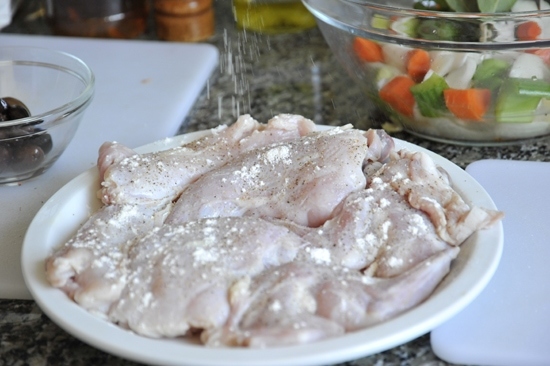 Remove the meat from the marinade, pat dry and sprinkle with salt, pepper and flour. 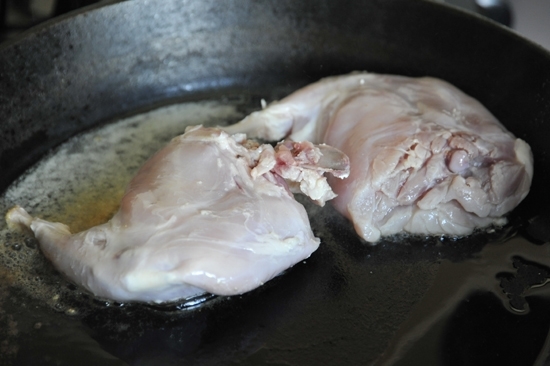 Place the rabbit legs, skin side down, along with the loins in the skillet until well browned. Turn over and brown the other side. Remove from the pan. 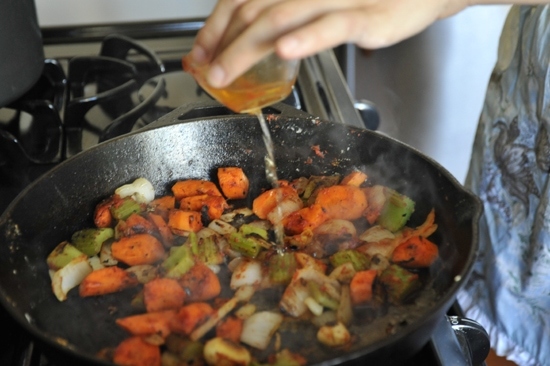 Add the vegetables from the marinade to the pan, and lightly caramelize in the same fat. Sprinkle with flour, stir and let cook for a few minutes. Add the tomato paste and cook for another few minutes. Deglaze the pan with the vinegar and reserved marinade, scraping up the brown bits on the bottom of the pan, and reduce the liquid until the sauce is thick. Return the legs to the skillet, skin side up, along with the loins and roasted rack. 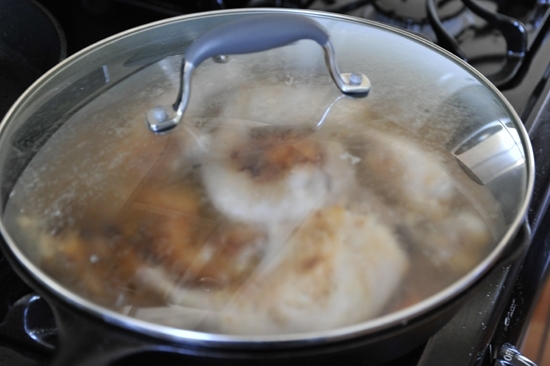 Add the chicken stock and bouquet garni, cover and let simmer for about 1 hour until the legs are tender. 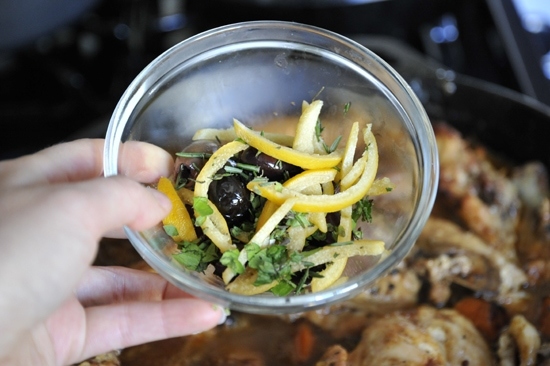 Turn off the heat and add the preserved lemon, olives and chopped herbs, stir and let sit for 15 minutes before serving. Beautiful! And it even tastes kind of like chicken. It sounds like a lot of work but, it looks soooo good and rabbit is one of my favorites! I will have to give it a try. This is crazy awsome. Rabbit. Seriously, you ENJOY killing animals?!!!! I have never met a woman in my life that enjoys that! I thought that was more of a neanderthal man kind of thing. I need to find a local supplier for rabbit. That dish looks soooo good. Try a local butcher, they are the straight path to great meat! Chris cooked a similar dish using fresh oranges from the yard, based on the recipe found in Martha Stewart’s Cooking School book and we loved it. 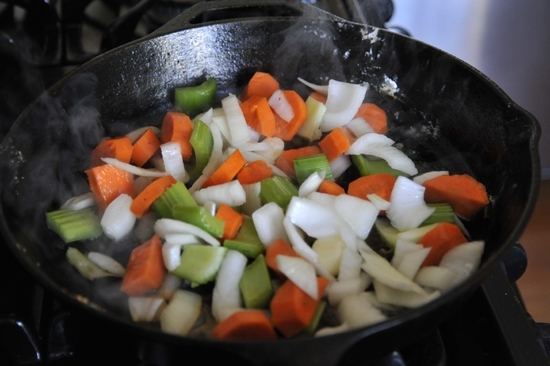 We’ll try this one, and yes, we’ll use our trusty 75 year old Griswold iron skillet, too. And a rabbit from the same back yard that supplies the lemons. BTW, many supermarkets and ethnic groceries have or can get frozen rabbit, but its from (where else) China. 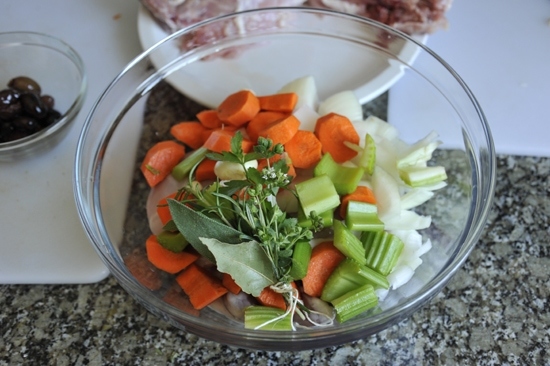 I bought a rabbit from a local farmer last Autumn and had now idea how to prepare it. I found your recipe and I made one the best meal I have ever prepared. It was so delicious! Thank you. Thank you James! That made my day. I’m so glad it worked out. I can see that happening soon in my Mum’s kitchen !